Every day, talented writers, directors, and actors work hard to fill screens with television’s most important product: the commercials. But which ads are actually entertaining, or even effective, and which make viewers feel worse about the product? Why Is This Commercial? takes a closer look at the TV commercials that baffle and beguile us. Nagging questions: Are viewers supposed to think this game and its creators are clever, or deluded? Did the company come up with the name for the app and only then, four weeks before the launch date, start figuring out what it’s supposed to be? The actor who plays the bespectacled project manager in these ads also played a GSIII owner who holds a place in an Apple Store line for his parents in a previous Samsung commercial; is this meant to be the same character? How well does the ad sell the product? Samsung has been aggressive in its TV advertising over the past couple of years, taking on Apple’s iPhone directly by pointing out the features of the Galaxy S III that the iPhone either can’t do or has been slow to match. The company’s most effective recent commercial was the aforementioned one where a herd of sheeple wait in line for the latest iPhone model, while much hipper GSIII users live quietly content lives with their allegedly superior smartphones. The Unicorn Apocalypse campaign is a curious one. On the one hand, these kind of low-key, single-camera-sitcom-style commercials often play better over the long haul, because the jokes and performances tend to be subtler, and thus not annoying to sit through over and over during the course of a single sporting event or awards show, which are pretty much the only times DVR-owning TV viewers encounter commercials these days. Here, the team behind this spot builds memorable characters in a short time, which isn’t easy to do, given that most of the commercial’s five-second scenes involve one character explaining a Galaxy Note II or GSIII feature to another. Case in point: the scene where a younger accountant goads her older colleague into consolidating her work phone and business phone into a single device. 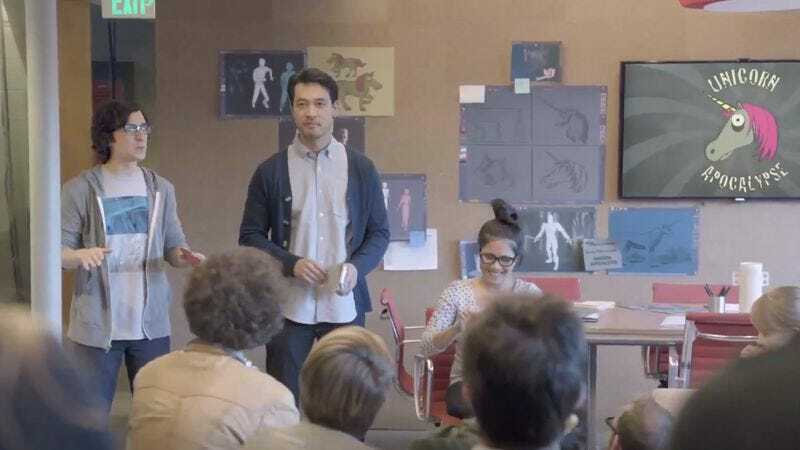 The moment plays like an actual office comedy, and it gets across a relatable idea: Modern business is full of exasperatingly behind-the-times co-workers who refuse to learn what the new technology can do. Don’t be that dinosaur. The problem with the Unicorn Apocalypse commercials is the same problem the Rogen/Rudd/Odenkirk “Next Big Thing” ad had: It makes the people who use and/or promote the Galaxy devices look like doofuses. (Or is that “doofi”?) This is the opposite of the iPhone-line commercial, where the Samsung users were chilled out and the Apple-heads were out of touch. Here, we see people bustling about to create a cruddy-looking, slapped-together game that none of them seem to have thought through. The campaign’s prevailing theme is that these Galaxy smartphones and tablets offer security, multitasking, networking, and all that, but the people who use them are either smug, dorky, or both—and they’re cranking out garbage. In other words, the spots invite viewers to join the schlocky generation.